I read this one really fast, when I started, I just needed to know that everything would work out. 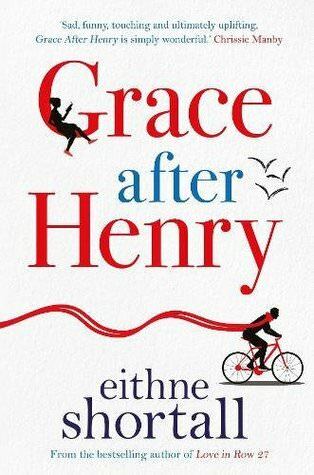 Grace and Henry are about to buy a house, and then he dies. A horrible accident and she can just not move on. She sees him everywhere and misses him so much. Which is obvious, and so heartbreaking. I liked her and I wanted her to be happy again. She has a great best friends. She has great parents. But she does not have Henry anymore. And she most learn to live again without him. Like move into a new house and try to put it to order. Meeting new neighbors. Going back to work. And last, seeing Henry and realising that the person she sees is real. And that was another thing that made me read like crazy! I had to know what was going on and what would happen. It was light for a book dealing with death. It had me hooked and it was so hard to put down. Grace becomes a friend. Heartbreaking, and still light and filled with hope. Life moves on. And maybe not always in the way the reader thought. It is a shame that death is part of life, but it is. We all must deal with it at some point. Great review. The person she sees is real? Now you have me curious! This one has me curious. I want to know more now. Sounds a little sad but nice too. That sounds like a very emotional read. This sounds great! Grief is such a hard thing but it seems to work well in books. I love it when a book tackles a serious subject in a lighter manner - this sounds great. The book description actually sounds very unsettling! If it weren't for the lighthearted cover, I would have thought it was a horror at first, lol!